Does obesity impact postoperative outcomes following robotic-assisted surgery for rectal cancer? 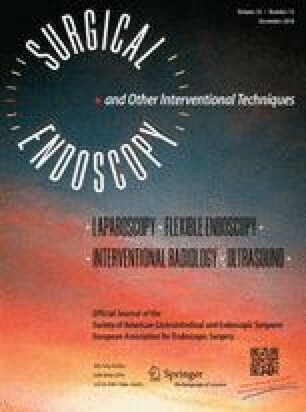 Obesity has been identified as a risk factor for both conversion and severe postoperative morbidity in patients undergoing laparoscopic rectal resection. Robotic-assisted surgery (RAS) is proposed to overcome some of the technical limitations associated with laparoscopic surgery for rectal cancer. The aim of our study was to determine if obesity remains a risk factor for severe morbidity in patients undergoing robotic-assisted rectal resection. This study was a retrospective review of a prospective database. A total of 183 patients undergoing restorative RAS for rectal cancer between 2007 and 2016 were divided into 2 groups: control (BMI < 30 kg/m2; n = 125) and obese (BMI ≥ 30 kg/m2; n = 58). Clinicopathologic data, 30-day postoperative morbidity, and perioperative outcomes were compared between groups. The main outcome was severe postoperative morbidity defined as any complication graded Clavien-Dindo ≥ 3. Control and obese groups had similar clinicopathologic characteristics. Severe complications were observed in 9 (7%) and 4 (7%) patients, respectively (p > 0.99). Obesity did not impact conversion, anastomotic leak rate, length of stay, or readmission but was significantly associated with increased postoperative morbidity (29 vs. 45%; p = 0.04) and especially more postoperative ileus (11 vs. 26%; p = 0.01). Obesity and male gender were the two independent risk factors for postoperative overall morbidity (OR 1.97; 95% CI 1.02–3.94; p = 0.04 and OR 2.23; 95% CI 1.10–4.76; p = 0.03, respectively). ‎Obesity did not impact severe morbidity or conversion rate following RAS for rectal cancer but remained a risk factor for overall morbidity and especially postoperative ileus. We thank the members of the ‘Fondation SanTDige’ for their support by a grant to Emilie Duchalais. The ‘Fondation SanTDige’ provided a grant to Emilie Duchalais. Drs Emilie Duchalais, Nikolaos Machairas, Scott R. Kelley, Ron G. Landman, Amit Merchea, Dorin T. Colibaseanu, Kellie L. Mathis, Eric J. Dozois, and David W. Larson have no conflicts of interest or financial ties to disclose.